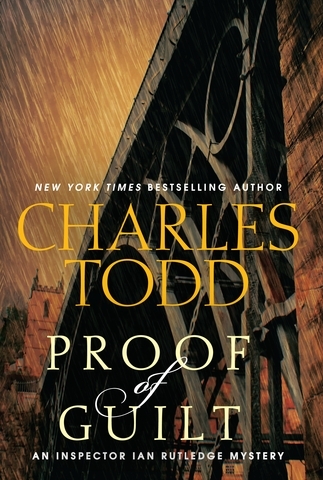 In their fifteenth outing together, mother-and-son team Caroline and Charles Todd follow Scotland Yard Inspector Ian Rutledge into the countryside in search of a murderer in Proof of Guilt. Those new to the series learn enough of his back-story and WWI experience to understand his personal demons and the reason for the ever-present Hamish, the voice who alternately guides and chides the detective, just over his shoulder and always out of sight. Readers familiar with the series will enjoy Rutledge’s careful but frustrating investigation. His sister Frances, whom Rutledge has come to depend upon for companionship in his darker days, has her own surprising news. This time Rutledge is dealing with getting to know his new Acting Chief Superintendent, a man who decides on a course based on reading reports and refuses to listen to Rutledge’s instinctual alternate theories. At times it seems the Super is deliberately thwarting Rutledge in his investigation. When a car runs over the body of young man, the heirloom pocket watch found on him is the only clue to his identity. It soon becomes apparent the man did not die on the quiet but dignified street where he was found, but was dumped there. Is this a clue to who he is, or a warning to someone living on that street? The search for the man’s identity leads Rutledge to the co-owner of a Madeira wine company. Lewis French has gone missing, but it’s not his body on the slab in the morgue. Then how did the dead man end up with French’s watch? And where is Lewis French? Rutledge finds French’s sister to be an angry and jealous person who had quarreled with her brother just before his disappearance; his fiancee` seems less concerned than she might be. He also finds himself drawn to the man’s former jilted fiancee`. There seem to be plenty of people who might want French dead. But if French is dead, where is his body? And how does a second disappearance of a war veteran tie in? The time period necessitates a slower pace, as Rutledge must navigate by his own motor car to the various country villages outside London that eat into his precious time to follow the slender threads he uncovers. This is not a fast-paced thriller but more the deliberate and tenacious unraveling of a plot with fingers lasting decades. Rutledge must find evidence to trap the killer before he becomes the latest victim.